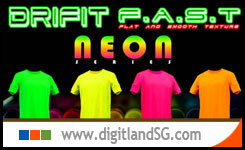 Round Neck: Neon Yellow tee, Neon Green tee, Neon Orange tee, Neon Pink tee. Let’s the Neon T-shirts do the Talking for you. click for more information. 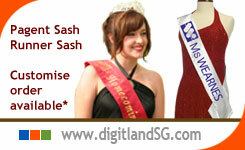 we supply Pageant Sash, Running Sash, Event Sash with Printing Service. 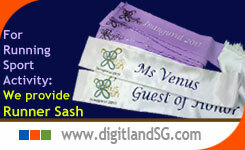 Ready Stock available: White color Satin Sash and Customer can request to print your Customise Title Text. 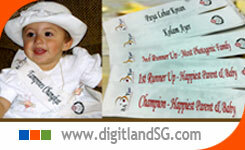 Order your Button Badge with DigitLand, Event Badges, School Badges, Printing in Singapore. We accept order: MOQ start from 100, 200, 500, 1000, 5000pcs .. or more. Click more detail for further info. 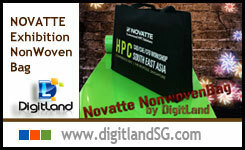 DigitLand supply both Ready Stock or Customise Production: Non-Woven Bag, Tote Bag, Eco Bag for Corporate Event and Function use. MOQ start from 100 pcs to 1000pcs for Ready Stock order. Customise Order need MOQ-1000pcs and above. We accept International Order and shipped to our WorldWide Customers. Always possible @ DigitLand. MOQ 1000, 3000, 5000pcs per order. 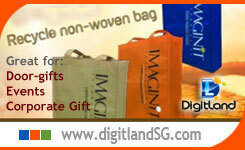 Email : enq18@digitlandSG.com for more information. For Sport, Running Events, looking for Runner Sash? DigitLand specialise in produce Runner Sashes over World Wide Supply. For Activity or Events, looking for specific small baby size Sash? 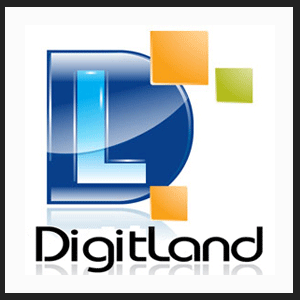 DigitLand can help you to produce your special request size only at MOQ 36pcs and above.